And that is a fact. Windsurfing has something that attracts the young generation. The fun, excitement and competitiveness drives thousands of youths into the sport on a yearly basis. Pictured above are the top three youth girls of the 2013 Techno293 World Championships held in Sopot, Poland. Three smiling faces of girls that will follow their careers as pro. In the centre of the picture is Russia’s Stefania Elfutina. Just three years after winning the U17 category in Sopot, Stefania won the bronze medal at the 2016 Summer Olympics. What a story for the young sailor, one in a thousand you might say and you’d be almost right. Back in 2013 there were 74 U17 girls from 21 countries, 5 continents competing for the title. 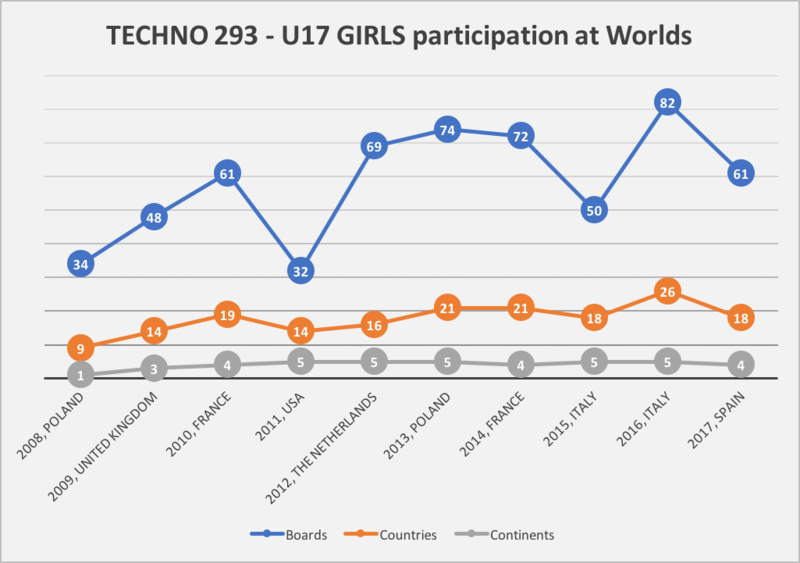 Altogether in the last ten years 928 youth and junior girls have participated in Techno293 World Championships. That is almost 1000 girls from around the globe meeting in one place at one time to meet, compete, learn and have fun. Not all of them will become world champions or win Olympic medals, but all of them, thanks to windsurfing, will have new experiences and memories for life. 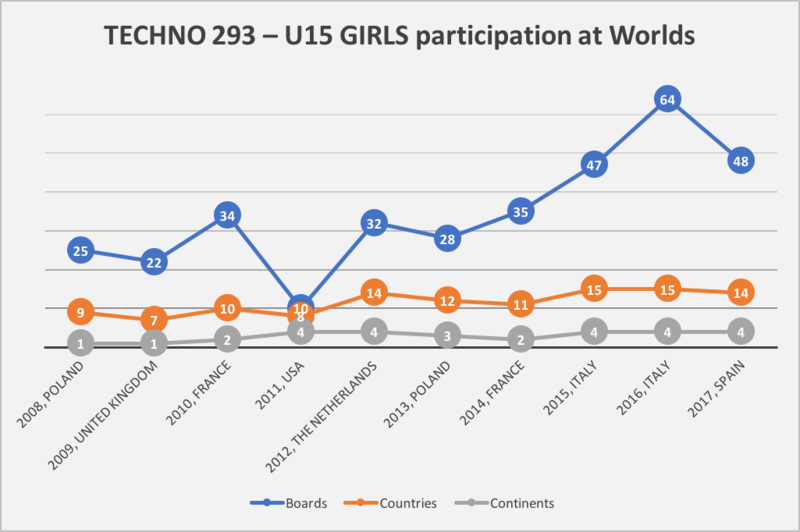 The total number of junior and youth girls combined fluctuates depending on the venue and timing of the event. A little less windsurfer girls participated in the Worlds when the class went to USA and a little more, when the event was held in Garda. Presented on the graphs you have the number of continents and countries represented by the attending female sailors. What you’ll see is that for over 100 girls from all over racing the Techno293 is a way of life. Like Stefania, they grow and move on, but new ones come to take their place year after year.